Universal Air Extraction System is available here. 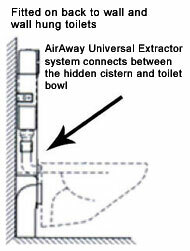 Choose The AirAway Universal Extractor™ for fitting to the widest range of wall mounted and back-to-wall toilets. Buy the AirAway Universal Extractor™ Now! 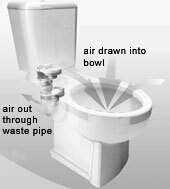 © 2011 AirAway Ltd. and Logical Events Ltd.
* Please note: Interpretation of the Building Regulations Part F can be controversial in respect of air extraction, dependent upon the local authority involved. The low level installation position of Odourbuster extraction units relative to the preferred position “within 400mm of the ceiling” may not be acceptable to some Building Inspectors. 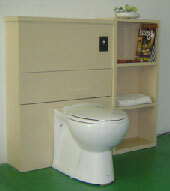 We recommend always seeking Building Inspectors approval prior to installation.